FINAL SPACING: Do not plant. NATURAL HABITAT AND PREFERRED SITE: Arizona ash grows naturally in the high mountains and cool canyons of the Trans-Pecos and along streams, rivers, and dry streambeds. It is a plant that likes protected places where there is almost constant water. It is native to El Paso County, Culbertson County, Guadalupe Mountains and the drainage creeks off Jeff Davis County and other West Texas areas. Unfortunately this plant has been planted in many residential areas because it is so easy to propagate and grow into a sellable plant. 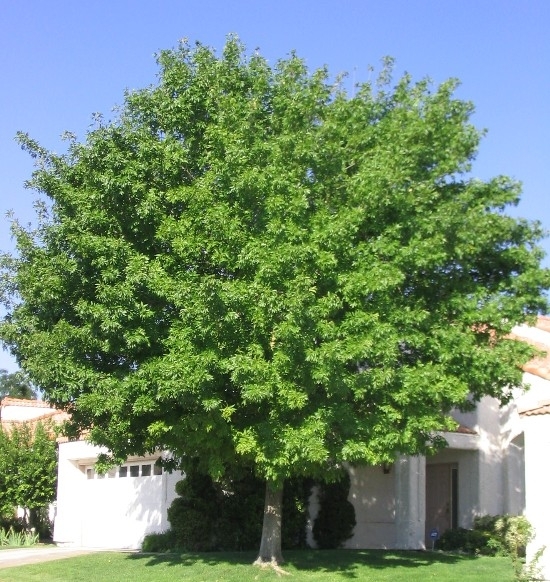 IDENTIFICATION INFORMATION: Arizona ash or velvet ash is a fast growing trunk tree. It has brittle wood, yellow fall color, and usually a lot of dead branches. It is quite attractive some years. FLOWERS AND FRUIT: The flowers appear in clusters before the leaves emerge in the spring. Male and female flowers are on separate plants (dioecious). Flowers have no petals. The fruit are samaras (winged seeds) about one to one and a half inches long. BARK: Light gray to off-white in color. Relatively smooth uninteresting bark. FOLIAGE: Compound leaves about 8 to 10 inches long with leaflets that are about two to three inches in length. CULTURE: Arizona ash will grow in most any soil but needs a lot of water and light fertilization. PROBLEMS: It is susceptible to all kinds of problems. It is short lived to begin with but also susceptible to insects, diseases and freeze damage in the northern part of the state. It was introduced as a drought tolerant, low maintenance tree but is far from it. The only reason it is on the market is that It is easy to grow from seed or stem cuttings. PROPAGATION: Best not - it's a junky tree. INSIGHT: These photographs make it look like a pretty good tree, but don’t be fooled. In its native habitat and occasionally in the rest of Texas the fall color is outstanding, but the tree is simply not a good investment.